Whether you are needing a conventional or LCG™ (Low Center of Gravity) style 20, 30 or 40-Series industrial carrier, Century® and Chevron™ brands have you covered. Capacities range from 20,000 lbs. to 40,000 lbs. and deck options range from steel, tungsten wood plank, to traction decking for forestry and other heavy equipment. 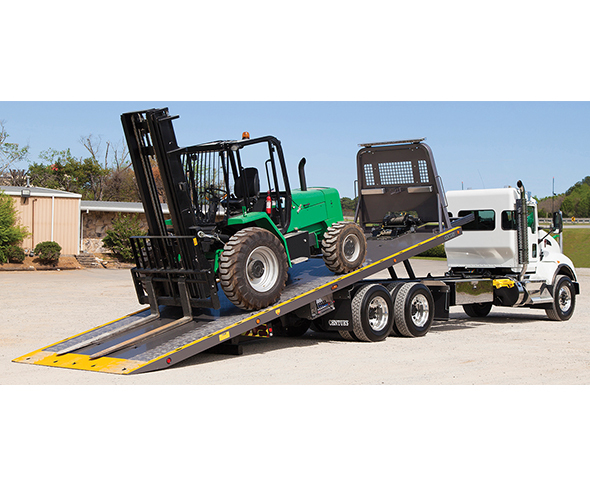 The LCG™ option allows you to haul taller loads with its 6” to 8” lower deck height over the conventional style. Other features include a hydraulic deck stabilizer, underlift accessories, and an optional frame mounted pintle hitch attachment holder. Call 800-292-0330 or visit MillerInd.com.